Every year the Today programme invites people in the public eye, from artists and musicians to business men and royalty, to guest edit the programme in the week after Christmas. The fifth and final programme was edited by architect Zaha Hadid. She was interested in the impact technology is having on the buildings that it is now possible to construct, to discuss the peaceful and prosperous Baghdad of her youth and to look into the architectural boom in Dubai and Abu Dhabi. Because our guest editor is an architect, we thought that instead of commissioning a profile of her, we would profile the building that she feels best epitomises her work. With this in mind, the Director of the Design Museum, Deyan Sudjic, was sent to Wolfsburg in Germany, to share his thoughts on the Phaeno Science Centre. Zaha Hadid managed to arrange an interview with style guru and Chanel designer Karl Lagerfeld, with whom she worked designing a mobile museum to the Chanel handbag. He spoke to presenter Evan Davis about high fashion in the credit crunch, size zero models and the ethics of fur in fashion. She was keen to highlight the dramatic impact computer technology has had on the way buildings are designed and constructed. Reporter Tom Feilden visited Zaha Hadid's hi-tech offices and Lincoln Cathedral to see how the boom in innovative design compares to creative leaps of the past. Zaha also wanted us to look at the work of the Architectural Association, the design school in London where she trained in the 1970s. During the 1960s and 70s, the school specialised in educating architects who designed fiercely experimental buildings which were often impossible to build. Reporter Sanchia Berg interviewed two graduates of the school, Sir Peter Cook and Charles Jencks, about what drove them to such experimental projects and the importance of their approach now that technological advances have made more of their ideas possible. The guest editor says that in the 1950s, Baghdad had the money and confidence to commission great architects to design great buildings. Correspondent Caroline Wyatt visits Baghdad University, designed in part by Bauhaus founder Walter Gropius, to see what the building reveals about the city's history. Baghdad was not only architecturally important in the 1950s. It was a prosperous and liberal city with Christians, Muslims, and Jews living side by side. Baghdad correspondent Humphrey Hawksley speaks to Baghdad residents who remember its "glory years" and Sami Zubaida, emeritus professor of politics and sociology at Birkbeck, University of London, discusses the cultural scene in Baghdad 50 years ago. Zaha believes that the next globally symbolic buildings - like the Eiffel Tower and Sydney Opera House - are being built in gulf states Dubai and Abu Dhabi. Correspondent Tim Franks visits the cities which are developing a reputation for commissioning the most interesting architecture anywhere in the world. Zaha Hadid is a world renowned architect whose designs have re-invented architectural theory and have won numerous competitions around the world. 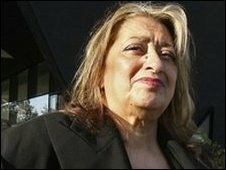 Born on 31 October 1950 in Baghdad, Zaha Hadid studied mathematics at the American University of Beirut before moving to London to study at the Architectural Association (AA) School of Architecture. On graduating she joined two of her former teachers at Office for Metropolitan Architecture, where she became a partner in 1977, and took up a teaching post at the AA. In 1980 she set up her own architecture practice in London which continues to this day. She also continues to teach, and has taken up guest professorships in prestigious international universities including Harvard and Yale in the US. She has been awarded a CBE for services to architecture and in 2004 became the first woman to win the Pritzker Architecture Prize, the equivalent of a Nobel Prize for architecture. Can we have too much choice? Is the smoking ban 'authoritarian'? Are we in the midst of a golden age of British theatre?